Memories of the International Sahara Festival, Re-ignited! I see Zine Al Abidine ben Ali every day! Well let me explain. 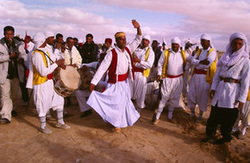 In December 2002 I attended the International Sahara Festival in Douz, Tunisia. Afterward, I visited the local tourist office and they were giving away posters of the event. Headlined across the top was the name of the Tunisian President, Zine Al Abidine ben Ali. Underneath was a graphic of a camel with palm trees, along with mention of the Festival Highlights, including the dromedary (one-humped camel) race. When I returned to Canada, I had the poster framed and to this day it graces one of the rooms in my home. It was not until the recent turmoil in Tunisia, resulting in the downfall of the President, that I started to reflect on what an incredible time I had at the Festival and how, literally, every day for the past 10 years, the name Zine Abidine ben Ali has appeared before my eyes. I was on an adventure tour to Tunisia and am still not sure whether our guide planned our visit to Douz in conjunction with the Festival or whether it was just one of those serendipitous happenings. On December 20, 2002 we were heading to Zaafrane, about 12 km south of Douz to start our three day Camel Safari. We stopped for lunch in Douz and afterward, wandered the town, only to stumble upon the crowds heading to the stadium. This was the pre-digital memory card days of photography, so I had my 25 roles of film with me, 36 exposures per film. On that first day I shot 2 rolls within the first 30 minutes. Hundreds of brightly dressed men and women, representing all the peoples of North Africa had descended on the small town of Douz. They had set up their living tents in an area in the centre of the stadium’s race track, and the locals were grabbing seats in the stadium to watch the events. My photo-common-sense told me that ‘the place to be’ was with the Festival participants, and not sitting in the stands with the spectators, so we walked to the far-end of the race track, crossed to the inside area—and wandered back to talk and photograph the contestants. No words can describe the cacophony of sound, the bright colours, the musicians, the decorated camels, the ululating cheers of the women, the smiles and laughter of the kids. As it was opening day and we had to leave before the events started we were a bit disappointed but our guide promised a return visit on the last day of the festival, after our camel adventure. Again, once in the tent area, we chatted with the men and their families, played games with the kids, and arranged for a Toureg horseman to ‘kidnap’ one of our group who really wanted to ride a horse. We watched the greyhound dog races, horse races, and camel races. We were right there …next to the procession of musicians from about 6 different countries. We saw the camel decoration competition where the women rode on top of the camel, secured from view inside a saddle hut. And we saw the magnificent Mehari –the pure white racing camels that stand out like white giants in the crowd of brown camels. At the end of the day, practicing our camel commands (Ugid—which means ‘stop doing that” which comes in handy when you are trying to photograph a camel and he/she tried to eat your hat or camera), we took our last photos, bade our new friends goodbye and departed for Tozeur, our next stop in the Tunisian south. And to think that all these memories were re-ignited when Zine Al Abidine ben Ali was ousted from power a few weeks ago. The poster will stay on my wall. Now it’s part of Tunisian history and my personal history as well.